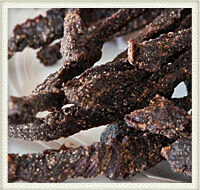 There’s no doubt…Stripling’s Jerky is an intensely meaty, flavorful and wholesome product. Made only with premium cuts of 100% beef or pork, every piece is hand trimmed to ensure a consistently textured, lean product each and every time. Each strip then hand-tossed with simple, honest ingredients - pepper, salt, spices, garlic and onion – and slowly smoked over smoldering seasoned hickory. 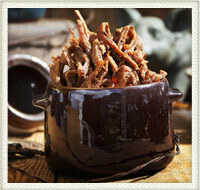 The result is a tender, tasty, low-fat and satisfying treat. 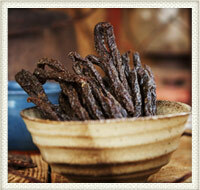 Also low fat, low carb, low cholesterol and with a 12 month shelf life. Truly a premium product you’ll be proud to offer your customers. Stripling’s label or your own! 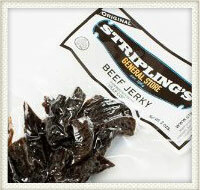 Stripling’s never uses artificial flavorings, nitrites, MSG, sugar or liquid smoke. 1221 Counter Bucket with 12 4oz. 1222 Counter Bucket with 12 4oz. 1231 Counter Clip Rack with 12 4oz. 1232 Counter Clip Rack with 12 2oz. 1233 Counter Clip Rack with 12 2oz. and 12 4oz. 1241 Wooden Floor Display with 12 4oz. 1242 Wooden Floor Display with 12 2oz. 1243 Wooden Floor Display with 12 2oz. and 12 4oz.